Peter Derksen: teacher, mission worker; born 12 August 1928 in Reinland, Manitoba, Canada to Peter Isaac Derksen (9 August 1892, Neuendorf, Chortitza, South Russia – 4 June 1976, Abbotsford, British Columbia, Canada) and Maria (Neufeld) Derksen (5 July 1903, Neuendorf, Chortitza – 14 May 1977, Abbotsford, BC), refugees from Russia. He was the third child in a family of three daughters and two sons. Peter married Mary Klassen, daughter of Dietrich J. Klassen (1901-1986) and Agatha (Dyck) Klassen (1902-1972) on 18 August 1951 in Virgil, Ontario. Peter and Mary had six children: Evangeline, Richard, Rosaline, Wanda, William, and Lillian. Peter died at the age of 86 on 15 November 2014 in Abbotsford, BC, where he was buried. In 1936 the Derksen family moved from Manitoba to Abbotsford, British Columbia, where he received his education at North Poplar Elementary, Bethel Bible Institute (1942-1944) and Mennonite Educational Institute (1944-1947). Peter was baptized on 26 May 1947 by Elder J. B. Wiens at West Abbotsford Mennonite Church. In 1947, Peter went to Winnipeg, Manitoba to study at Mennonite Brethren Bible College (MBBC), where he met his life’s partner, Mary Klassen. Peter graduated from MBBC in 1950 and returned to Abbotsford to teach at Bethel Bible Institute for two years (1950-1952). During this time, Peter and Mary were married in the summer of 1951 in Virgil, Ontario. Peter was called to the ministry by the East Chilliwack Mennonite and West Abbotsford Mennonite congregations, and was ordained in August 1952 by Elder H.M. Epp. From 1952 to 1953, Peter studied at Bethel College in Newton, Kansas, and from 1953 to 1954 he studied at The Biblical Seminary in New York (later New York Theological Seminary) in New York City, NY. During this time Peter and Mary had two children, Evangeline and Richard. While at seminary, Peter and Mary sensed God’s call to serve as missions workers in Japan, leaving North America in 1954. They were guided by their life’s motto: For we do not preach ourselves, but Jesus as Lord, and ourselves as your servants for Jesus’ sake. (2 Corinthians 4: 5). In 1954 Peter and Mary were ordained as missionaries to Japan by Elder J. J. Thiessen, and worked in Japan from 1954-1999 under the General Conference Mennonite Church Commission on Overseas Mission. In 1956 Peter was ordained on the mission field in Japan. During their time in Japan four more children were born: Rosaline, William, Wanda, and Lillian. Peter’s children remember him waking them up in the mornings with an enthusiastic "Rise and shine!" During their first two years in Japan (1954-1956) Peter and Mary studied the Japanese language in the city of Kobe. The remainder of their time (1956-1999) was spent in evangelism, church formation, English teaching and church planting ministries in Nichinan (1956-1959), Hyuga (1960-1965 and 1966-1967), Oita (1967-1971 and 1972-1977), Beppu (1977-1987), Minami Oita (1988-1989), and Hakata/Fukuoka (1990-1999). All of these cities (other than Kobe) are located on the island of Kyushu, the southernmost of the four main islands of Japan. During their North American assignments in between terms of service in Japan, Peter completed his Master of Divinity degree at Mennonite Biblical Seminary (now Anabaptist Mennonite Biblical Seminary) in Elkhart, Indiana in 1972. In 1997 Peter had quadruple bypass surgery in Japan. During the final year of life, Peter struggled with his heart condition, Parkinson’s disease, and severe spinal headaches. After 45 years of ministry in Japan, Peter and Mary returned to Canada and settled in Abbotsford, BC. For seven years (2001-2008) they served the Surrey Japanese Mennonite Church on a part-time basis along with George and Martha Janzen. Peter also continued his ministry using Japanese software, spending hours writing many friends in Japan. 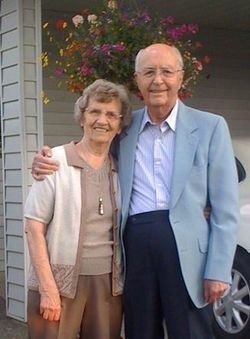 During the remainder of their retirement years the Derksens worshipped in the West Abbotsford and Emmanuel Mennonite congregations, and enjoyed time with children, grandchildren, great-grandchildren, and extended family across Canada and the United States. Froese, Deborah. "Peter Derksen: A Servant for Jesus' Sake." Mennonite Church Canada. 30 January 2015. Web. 2 May 2015. http://news.mennonitechurch.ca/peter-derksen-servant-jesus-sake. Derksen, Wanda. "Derksen, Peter (1928-2014)." Global Anabaptist Mennonite Encyclopedia Online. April 2015. Web. 25 Apr 2019. http://gameo.org/index.php?title=Derksen,_Peter_(1928-2014)&oldid=131502. Derksen, Wanda. (April 2015). Derksen, Peter (1928-2014). Global Anabaptist Mennonite Encyclopedia Online. Retrieved 25 April 2019, from http://gameo.org/index.php?title=Derksen,_Peter_(1928-2014)&oldid=131502. This page was last modified on 2 May 2015, at 18:31.